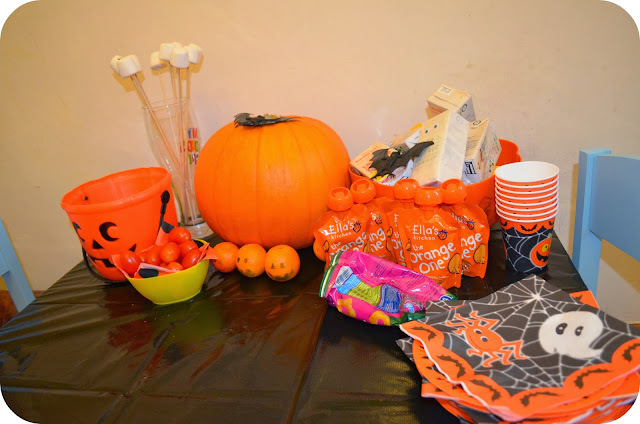 I have always loved Halloween; the excuse to dress up and eat lots of sweet treats, and although the boys are still too young to really appreciate it, I decided to throw a little party for them and a few of their friends. It seemed a great excuse to get them together and a lovely Sunday afternoon activity. A trip to Tescos for supplies and a few home-made touches, and here are the final results. A4 sheets of paper. 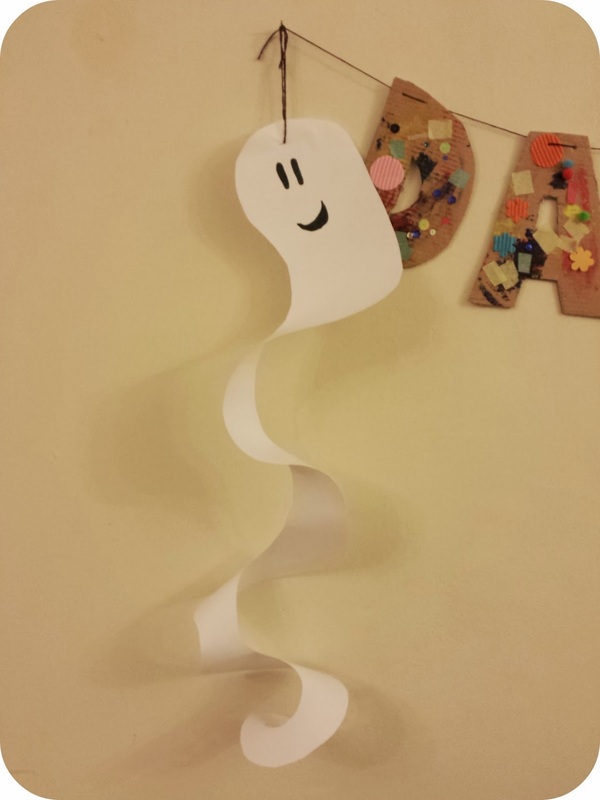 I drew a snail type shape and cut it out, and hung them around the house with pieces of cotton. 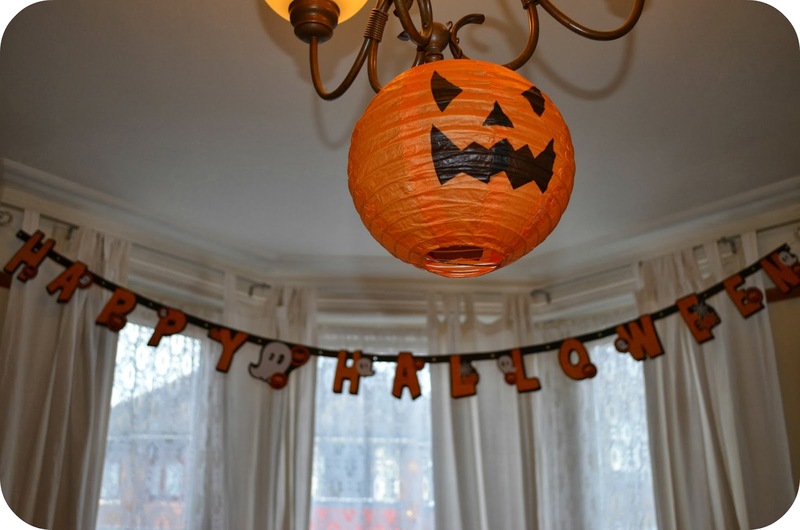 I hung up banners, and paper pumpkins, and had fresh pumpkins around the room. 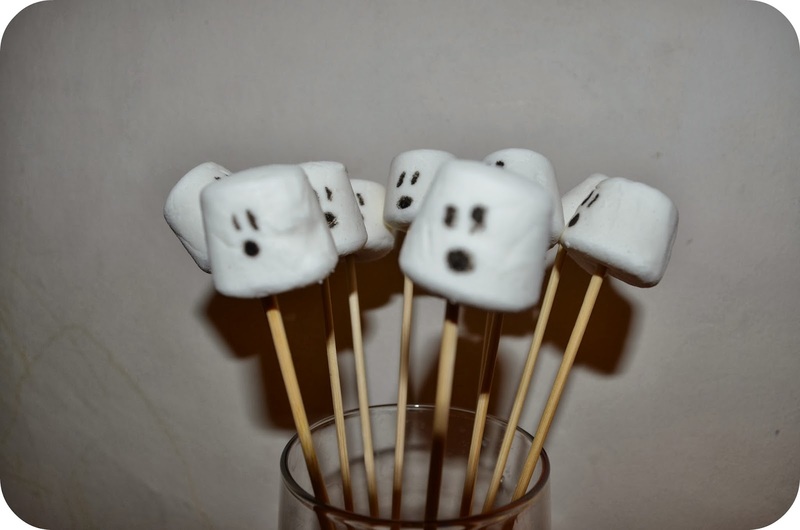 We left them uncarved, but will be adding some spooky faces before Halloween. I covered Dylan's table in a black table cloth and set out a spooky tea. 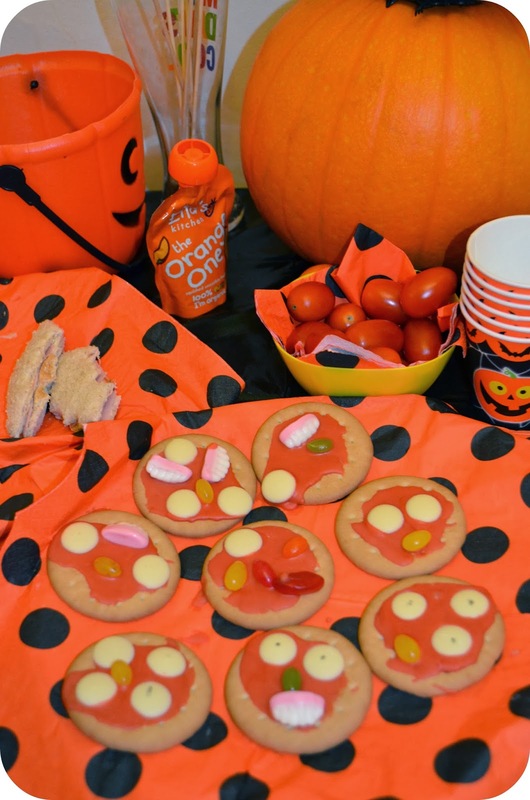 I used cookie cutters to make spider and bat shaped sandwiches, had a pumpkin bucket full of Organix crisps, left out cartons of juice and Ella's Kitchen organic smoothie pouches and filled a little bowl with tomatoes. We then had spooky ghost marshmallows (faces drawn on with edible pen), monster biscuits made from rich teas covered in coloured icing, white chocolate button eyes with black icing dots and plenty of sweets and spooky fruits. 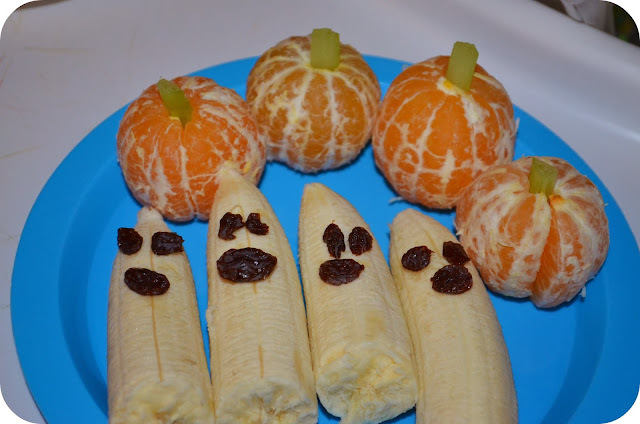 The kids loved the ghost bananas and pumpkin oranges! 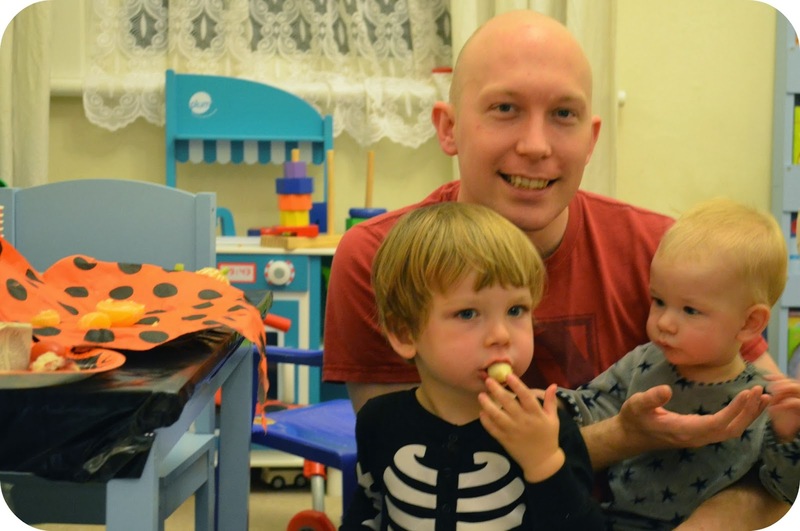 The toddlers had great fun and Dylan hasn't stopped pointing out pumpkins (or ponkees as he pronounces it) since. The party was minimal effort but full of spooky treats for those too little to be enjoying the candy. 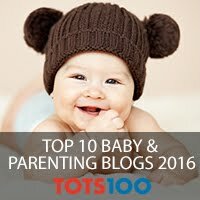 How do you celebrate Halloween with a toddler? 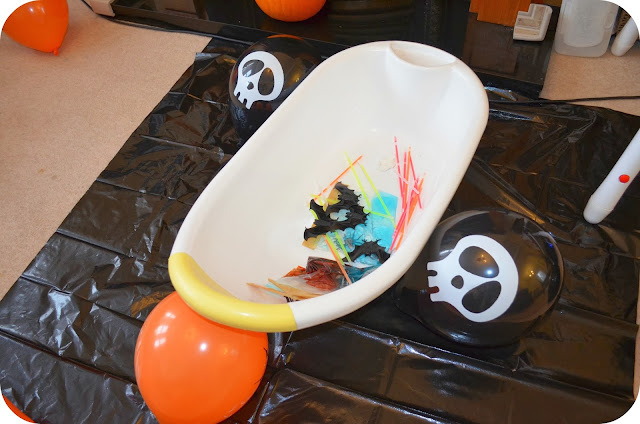 Wow looks great fun - we are off to a Halloween party tomorrow! This looks wonderful. I've decorated the house but am off our for dinner with friends tonight so no party here. Definitely next year though when we can go trick or treating round the grandparents' houses. fantastic ideas. I tried the healthy options but they were too keen on cake. I love the spooky bananas. So simple but really effective. Looks like a brilliant little party! Aw this looks great I might do a little party next year for Sienna! I think this is adorable!! You clearly went to an awful lot of effort - I hope you all had a fantastic time. looks like you had a great time with lots of fun! haha Love the little satsuma 'pumpkins'! Some great ideas, and love the sensory bag ideas, plus the hanging ghosts. 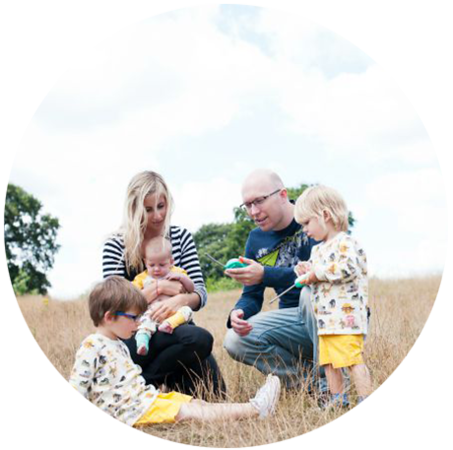 They're great as they can be adapted for other seasons too.